Anxious to get started making my own, I headed to Joanne's Fabric over the weekend. I found some great "faux linen" to use, this is going to help save a significant amout of cash since I need to make six covers for our dining room table. I am really hoping the chair covers will add some more style and brighten up the look of our dining room. However, I'm still unsure of what designs we will use on the back, but it will most likely be numbers or even a fun vintage design... feel free to send any ideas my way! Caffeinated and feeling ambitious I got started cutting the fabric into the 2 pieces (one for the chair back and one for the seat). I will be sure to get more detailed pictures of all the steps when I work on the next 5 covers. Oh, and yes, I have to use our dining room for my sewing space for now since we haven't put together our office yet (boo). After cutting the fabric (and putting on my pajamas I guess, whoops), I got started sewing the covers. I admit, I haven't sewn in a while, so I was nervous. I used to sew clothes all the time, but nothing for home other than curtains and pillows. So this is a challenge for me! Here is the after with the cover! I can't wait to add numbers or letters to the back! The fabric looks plain white in this photo, but the texture is similar to my linen blog background with hints of greys and browns. I'm going to try and crank out 2 more of these this week and 3 more next week. After finishing I will get started on the designs for the back! Alex installed our fancy-pants new toilet yesterday as part of our ongoing bathroom redo (hey we have full time jobs outside of this too!). I never really thought that much about a toilet, I mean you use it and clean it, but other than that I want nothing to do with the toilet, nor do I pay much attention to the appearance. So when Alex informed me he got a new toilet, my response was "well what's wrong with the old one?" Turns out, although they all serve the same function (hehe), there is a big difference between the 'economy' commode and the upgraded Kohler toilets at the ol' Home Depot. First off, size, the economy toilet is the smallest there is out there... and I don't want to go into detail here, but lets just say it is a serious upgrade. Secondly, functionality is so much better! He picked out the Kohler Wellworth, the best part is that it has 'Class 5 Flushing Technology'. So what does that mean? Here is what Kohler's website says "With names inspired by the raw power of whitewater rapids, this powerhouse features an industry-leading 3 1/4-inch flush valve, combined with an efficient, direct-fed jet, to maximize water flow and allow for an eco-friendly, 1.4-gallon flush setting option"- yes they compared it to 'whitewater rapids' which is strange, but we were attracted to the 1.4 gallon eco friendly flush option. So a light push gives a small flush and the full push is for a bigger flush (no need to elaborate here either). Last, the toilet just looks plain cool and fancy! So here we go (no "#2" jokes allowed), Alex already removed the old toilet (glad I wasn't here for that, sounds super gross and stinky not to mention it involved a sponge and rubber gloves). He covered the sewer/waste pipe while he worked on the rest of the bathroom so that no sewer gases would escape into the house. So once he was ready to install this bad boy he began by tipping it upside down to attach a ' Number 10 No Seep' wax ring (this is slightly larger than most wax rings as it is designed to accomodate new toilet installs where the flooring is slightly more elevated than the waste pipe - gotta love the 'charm' of 1924 construction). Once you get it good and gooped on really tight, it is ready to be installed over the waste pipe. We both aligned the toilet straight over the pipe and guided the bolts through the holes on each side of the toilet to be attached. Here is Alex tightening the mounting bolts. And here it is! Our new fancy pants (no pun intended) toilet! We are still working on the rest of the bathroom, beadboard is next along with new trim. Did I mention before that we also have to re-sand and paint the door because it was chipping? That is on the list too... hopefully we will get done with this soon! On one of our Home Depot Adventures to gather some more items for our bathroom project, I was excited to see a fall display out front of the store. I found a cute bag of mini pumpkins ($6) and dried corn ($3), I thought I could find a fun way to do a little fall decorating with them. I have never done any seasonal decorating in our house, other than Christmas, but I thought it would be fun to give it a try (but not spend too much money on it). I used a few of the mini pumpkins to make a fall centerpiece for our dinner table. The bowl and other elements are from Ikea. I used the rest of the items on our fireplace, I just wanted to give it a little bit of a fall look, but not overly theme it. I stood the corn against the fireplace with a couple pumpkins. Thankfully our dogs haven't considered them toys or food. I got this Smith and Hawken wicker pumpkin ($8.99) from Target and added a couple mini pumkins. I only spent around $18 and love the fall feel in our house! So as I wrote about in a previous blog, Layla and Kevin came to help us with our guest room redo (started here and here). Again, I am a HUGE fan of their blog, we have done projects on our house based on ideas we got from their blog like here and here. After we hit the Junk Bonanza, we got back to our house and Layla and Kevin started on our guest room. We had to wait downstairs, it was nerve racking having our house in someone else's hands! 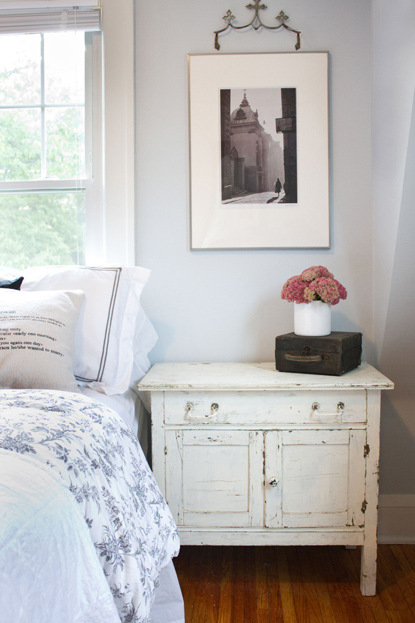 But we totally trusted Kevin and Layla to do something amazing with our guest room! We got most of the items at Junk Bonanza including: the chair, antique dress form, tin tiles, night table, metal wall markers, small antique case, vintage mint tin, and an antique framed bed spring with hanging letters. Layla and Kevin definitely have an eye for nice junk! Here is a view of the night table and wall markers. I LOVE the table that they found, it is worn perfectly, so shabby and cute! Layla used a container from our kitchen and picked these flowers from the front of our house. She put them on top of the antique black case, totally cute! Here's a closer look at the wall art, the picture is one we had already downstairs, I love that she put the metal widow's peak above the picture, I never would have thought to do that! We had the bedding in our house already, same goes for the dec pillows. Layla and Kevin switched things up and it looks great! The duvet is from Ikea and the quilt is a Shabby Chic quilt from Target. The lettered dec pillows are from Pottery Barn and the long bolster is from Ikea. This is a closer shot of the antique bedspring. We got some vintage letters and numbers to hang from it. Layla found the cards on a bulletin board we had by our basement door. She also suggested that we get some clothes pins to hang cards or pictures on the bedspring, like a bulletin board. Such a good idea! I can't wait to add the clothes pins! At Junk Bonanza, Layla told me to pick some letters that meant something to me. I looked for a C, A, Z, R or S, and could only find a C. I then thought what about a T and L so we can have TLC to stand for The Lettered Cottage so it will remind us of this experience. I think this is my favorite part of the room, well tied with the mattress spring. I LOVE my antique dressform, it is something I always wanted to have. Alex found it and surprised me with it, it was so sweet of him! The chair that Kevin and Layla found is perfect! I love the chipped paint and the color pops against our lighter blue walls. The mirror there was ours, Alex's mom got it for him, it also is a beautiful antique ! There is a vintage mint tin on the table as well and an old mason jar with dandelions Layla got from the Bonanza. 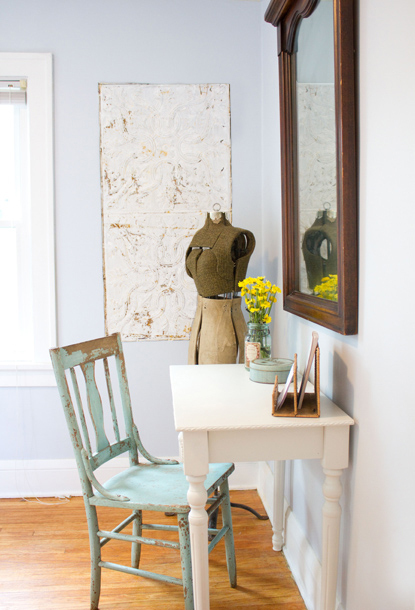 I also LOVE the large vintage tin tile, it looked perfect with our paint! Here we are with Kevin and Layla after the big reveal, which we had to tape about 5 times, and it is really hard to act surprised over and over, but it was fun! Alex made a blooper the second time we filmed our reaction, we opened the door and Alex yelled "Oh my gosh, what did you do? It looks terrible!" Then we all cracked up and had to tape the reveal again. Our final picture before they left, we had to take with my dressform. And that was it! The whole day was a blur, but so much fun. I also had to tape a few interviews about us, our house, and my love for the Lettered Cottage Blog! It was amazing having them at our house and spending the day with them. Layla and Kevin are so nice and fun to hang out with! I hope they had as much fun as we did! Bathroom Redo: Gettin' Our Grout On! Well the Bathroom Redo of Our Redo has completed the tile and grouting phase.﻿ This also shows the tile we chose for the floor. We wanted something with a more vintage feel to fit the look of our 1924 house. 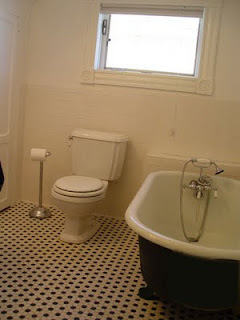 We have gone on a lot of historic home tours in the area and decided we wanted small black and white tiles. We found them in a lot of older homes and loved the look. Here is a picture of the inspiration (not our bathroom), I also think my grandmother's bathroom had tiles like these. Here are the steps that Alex took along the way, he was really happy that I was taking pictures of him, he loves to tile and grout (sarcasm font). Laying the last single tile! Laying the tile is complete! Then, after clearing the grout lines between tiles of any mortar that was there after the installation, Alex mixed the grout and began laying it in the lines with the float. After the 30 minutes passed, Alex cleaned the lines with a damp sponge. The directions say to wait 16 hours before you can walk on it, but we are going to wait 24 since we have had bad experiences before with tile and grout. We need that grout to solidify baby! Okay, so it really isn't a Mud Room at all, but hey, we have a space we can finally use at the back door! I first discussed my desire for a Mud Room here, and then talked about what would work in the space here. So with Alex hard at work in the upstairs bathroom, I have gotten the 'Not So Much a Mud Room' Mud Room put together! This really wasn't anything hard to do or put together, but it really works for us and it is also nice not having a blank space anymore in our house. Also, for anyone else that doesn't have space for a Mud Room like us, I think it is a great idea for a cute entry with some storage space! So here are the before and afters, the after pictures were taken later in the day after work, so they are a bit darker.. Here are the additions to the space: small stool from Ikea, Smith and Hawken round basket with chalkboard from Target, and wall hooks from Ikea as well. We couldn't find hooks with cubbies that would fit our space like I wanted, but the hooks are great! We also added some wall art we already had, like the mirror and metal charger. I love that the hooks match the wood trim we have in the house, and it will look cute in the winter with knit hats and scarves hung on it! I admit, I couldn't resist showing this picture, it is rare that our German Shorthair Sadie sits still for anything. I was in shock when I tried to take pictures of the basket and she strolled up and modeled next to it! I am in love with this basket! I thought I would get the rectangular one, but the circle fit the space well. The chalkboard on the basket makes it so cute! Close up view of the chalkboard, my favorite feature! Thinking it will say 'Boots' in a month or so (sad face). We added the Ikea stool to the small corner It may be tiny, but makes a big difference to us, nice to have a seat to remove shoes or set a big purse on when you walk through the door. Here is the metal charger we used to have in the dining room, but have relocated due to cool wall tins we found at Junk Bonanza (will blog about that soon). I don't think we are completely done with the space, I would like to add trim to the walls, or beadboard, or board and batten walls so spruce it up a little more. Ahh endless projects!